Republished with the permission of Mark Zimmermann, editor of the Catholic Standard newspaper of the Archdiocese of Washington. Like many of the boys and young men studying at The Heights School in Potomac, Maryland, brothers Zayd and Rayn Patel have well-rounded interests outside the classroom. Zayd Patel, 12, a sixth grader at The Heights, plays oboe in the school band and sings in its choir, is on its math team and runs track there. He also likes to play golf and squash, and plays keyboard and piano and is part of a rock band. Rayn Patel, 9, a fourth grader there, is nationally ranked for his age group in the sport of fencing. He plays trumpet in the school band and sings in its choir and is part of the drama club at The Heights and will be in the school play. 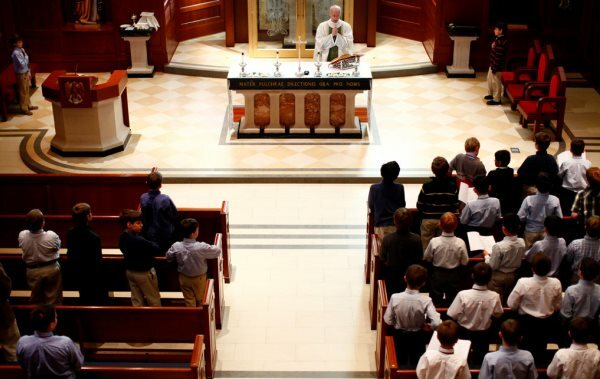 Both boys also like attending Mass at their school, which is offered daily there, with its 550 students between third and 12th grade given the option of voluntarily coming to Mass, and about 200 do each day. And their younger brother Raif, 5, who is in kindergarten and homeschooled by their mother, plays the violin and just started playing ice hockey. “They follow their own paths!” said their mother, Zeena Lafeer, laughing after her sons had described their range of activities. 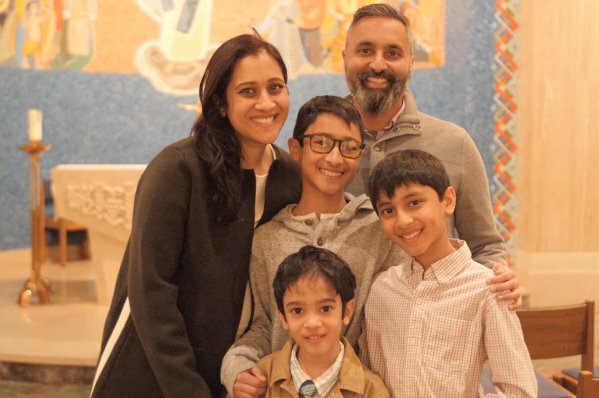 And this Lent, Zeena Lafeer and her husband Sameer Patel and their three sons are on a special path, together, as they prepare to receive the sacraments of initiation and become Catholic at the April 20 Easter Vigil at the Church of the Little Flower in Bethesda. The parents and their two oldest sons will be baptized, confirmed and receive their First Communion, and their youngest son will be baptized. Zeena Lafeer noted that she and her husband both were raised Muslim and attended Catholic schools over the years and wanted a faith-based education for their sons. Many of the couple’s friends and the people who were most influential in their lives were Catholic, she added. Sameer Patel, who has family roots in India, grew up in Niagara Falls, New York, and attended Catholic elementary school there. His father is Hindu and his mother is Muslim. Zeena Lafeer’s parents are both Muslim and are immigrants from Sri Lanka. She was born and grew up in Leonardtown, Maryland, where her father was a pediatrician, and she attended Father Andrew White, S.J. School and St. Mary’s Ryken High School there. “I saw a different way of worshiping God, (but) I knew it was the same God,” she said, noting that she attended Mass and religion classes with the other students there, and felt peaceful in church. “Forgiveness and hope were aspects my friends had,” she said. The couple met at Georgetown University in Washington, D.C., where Sameer Patel studied English, and Zeena Lafeer studied economics and international relations and minored in Arabic. She said the philosophy and theology classes there left her with questions about the role of faith in her life. “It sort of ended one chapter, and I didn’t know the next one,” she said. Sameer Patel sang in an a cappella group at Georgetown called The Chimes, where a Jesuit priest, Father James Walsh, a religion teacher at the university, sang with the group and was a friend and mentor to Patel. The couple started dating at Georgetown, and they were married in 2002. Both have an interest in music that has continued in their lives. Zeena Lafeer plays the piano and flute, and works together with her youngest son Raif as he is learning violin in the Suzuki program. Sameer Patel, who still likes to sing and plays some guitar, founded and is the owner of the Bach to Rock Music Schools in Bristow, Virginia, and in Fulton, Maryland. The schools offer music instruction in different instruments to all ages, from small children to senior citizens, with classes and a band program and a music camp, and also programs in disc jockeying and music production. The family’s educational efforts began when their oldest son Zayd was 2 years old in 2010, and they opened the Bristow Montessori School, where Sameer Patel continues to serve as chairman of the board. Five years later in that Virginia community, they opened the Bach to Rock Music School next door, and three years after that they began the music school in Maryland. He said participating in music helps children grow in confidence, and learn how to be organized and practice something to get better at it. “It gives them an outlet to express themselves,” he said, adding that it’s gratifying to see parents at a recital or live show, enjoying their children’s performances. Education has remained central to their lives, and Zeena Lafeer said she has enjoyed being a homeschooling parent, teaching her sons to read. Now she is teaching Raif how to add, subtract and multiply numbers. And now the family is learning together about the Catholic faith, in preparation for receiving the sacraments at Easter. 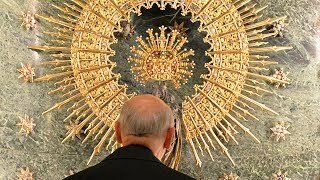 He said their family has been inspired by the teachers and families at The Heights, which is sponsored by the Opus Dei prelature of the Catholic Church. On a recent Friday morning, the parents and their youngest son joined Zayd and Rayn at a daily Mass in the school’s chapel, along with many other students and some family members. The Patel family prayed together at the Mass, and during Communion, they knelt before the altar together and received a blessing from the priest. At the Church of the Little Flower in Bethesda, Deacon Don Longano said it has been a privilege for him to prepare the Patel family to receive the sacraments at the Easter Vigil. At The Heights School, Alvaro De Vicente, the headmaster, praised the witness of the Patel family, and noted that another school family, and two senior boys, are also becoming Catholic this Easter. He added that the boys attending The Heights “are exposed to joyful Christianity,” from their teachers, peers and fellow families.